DFID will provide up to £6 million of UK aid to send humanitarian relief to people in Mozambique and Malawi affected by Cyclone Idai. 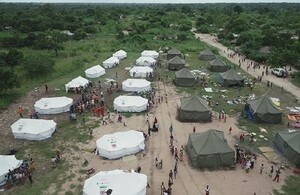 Tents supplied by UK aid that were already in Mozambique ahead of Cyclone Idai. The UK will provide up to £6 million of UK aid to support the victims of a devastating cyclone and torrential rains which may have left more than a thousand people dead in Mozambique, International Development Secretary Penny Mordaunt announced today (18 March). The UN estimate that 600,000 people are affected in Mozambique and 900,000 in Malawi. The UK will also send tents and thousands of shelter kits to Mozambique to help provide immediate shelter to those that have been forced to flee their homes. I have made £6 million of UK aid available to help meet the immediate needs of people who have lost everything. We have deployed a UK team of DFID experts who are now on the ground in Mozambique helping to co-ordinate the UK’s response to this disaster, and we hope to have vital UK aid supplies in the region shortly. We stand ready to scale up our support if needed. The images of loss and devastation following this deadly cyclone and extreme weather are shocking. The people of Mozambique, Malawi and Zimbabwe should know that they are firmly in our thoughts at this difficult time, and that the UK stands by their side. In addition to today’s new support, DFID already provides core funding to international aid organisations on the ground, including UN agencies and the Red Cross movement, which are providing emergency humanitarian relief as part of the international response in the region. UK aid is also supporting the World Food Programme (WFP) to feed 130,000 people for two weeks in Mozambique by distributing emergency food and food vouchers for people to use at local markets. In Malawi, UK support will help the WFP provide cash transfers so that 140,000 people can feed themselves until the end of March. DFID is also the biggest donor to the START Fund, which has allocated £400,000, to enable NGOs Trocaire and HelpAge International to meet immediate needs such as clean water and shelter in Malawi. DFID has staff based in Zimbabwe who are working with partners to understand what is needed to support humanitarian operations on the ground. Today’s announcement of £6 million of UK aid is new money from HMG’s crisis reserve. The UK expects to send up to 100 tents and up to 7,550 shelter kits to Mozambique tomorrow (19 March). This is based on DFID’s ability to transport the items and assessment of needs on the ground. This could change as the situation on the ground evolves. Earlier today the President of Mozambique said he believed the death toll may already be over 1,000. DFID has already provided £764,000 to the World Food Programme to provide food and food vouchers. This is an allocation from DFID Mozambique’s annual budget for 2018/19. DFID provided approximately £1.5 million from the 2018 Mozambique bilateral budget to preposition relief items in warehouses of the Mozambique National Institute for Disaster Management. Since June 2018, DFID has provided £10.5 million to WFP and UNICEF to get food and nutritional support to vulnerable people in Malawi.